When a blizzard strikes, staying safe means being prepared. The most common issues are power outages and dangerous commuting. If you know a blizzard is coming, assume that you could lose power and have candles and flashlights ready. Because you may not be able to drive during a snow storm, have some non-spoilable food and drinking water on hand. Stay safe if you get caught in a blizzard this year. Pass this infographic along to friends, family and co-workers this year and remind them how they can stay safe when a snow storm strikes. The best advice is to prepare long before the forecast turns grim. Stocking up on batteries, water and food can help. 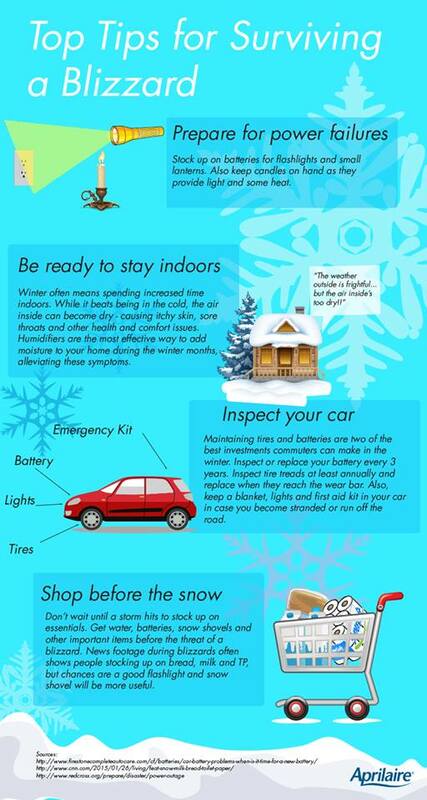 You can also prepare for wicked winter weather by ensuring your indoor air quality is under control. Proper humidity can help improve comfort, health and protect your home from dry winter air. Visit the Aprilaire website to learn more about humidity control this winter. Next Next post: El Nino, Climate Change and Your Allergies – Is there a Link?